I pass by specialized coffee shop daily when going to lunch. Well, I don’t just pass by. It is the place for me to enjoy quality coffee, good service and relax before heading back to the office. It is my sanctuary which I have managed to fit to my daily routines. It just has something that the coffee shop next to it doesn’t have. Reflecting to personal experiences for buying a coffee from the specialized coffee shop, it has limited selection of tea’s, coffee beans and truffles. Coffee is made based on daily selection or based on customer selection. Each customer is served personally and there is social interaction between the customer and barman. So it is not just about the coffee or tea. Here can be identified use environment where the service is used, customer participation when there is selection to choose from and social interaction between the service user and service provider. Regular visitors don’t mind about queuing because they know they get personal and good service. Even though when the action stays the same, other variables bring new elements to the experience and this makes it memorable. 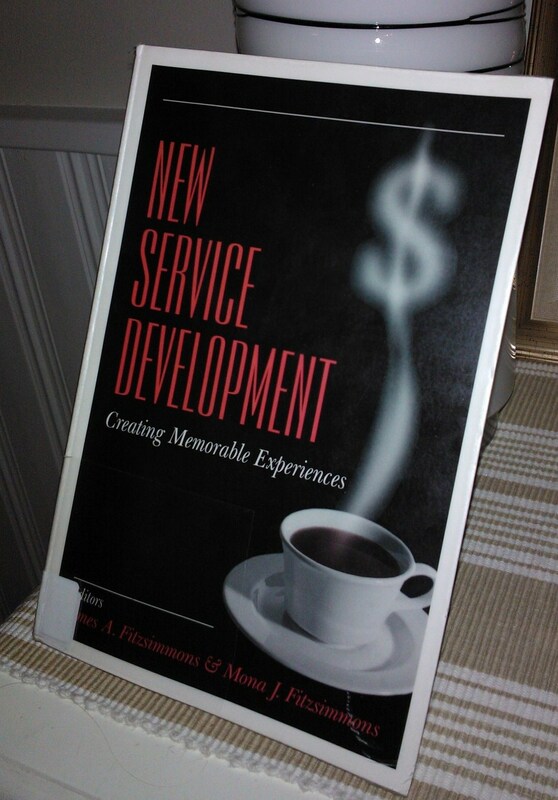 Experience is defined as learning event where customer interacts with different contexts created by service provider (Fitzsimmons & Fitzsimmons 2000, 35). Service users often reflect the experience for feelings and in some cases it is connected to environment properties that stimulate those feelings. In some cases you don’t have such stimulants due to type of the service provided. New service development process constitutes from four main steps that are presented below. Figure 1: The NSD process cycle, adapted from Johnson et al. (2000). 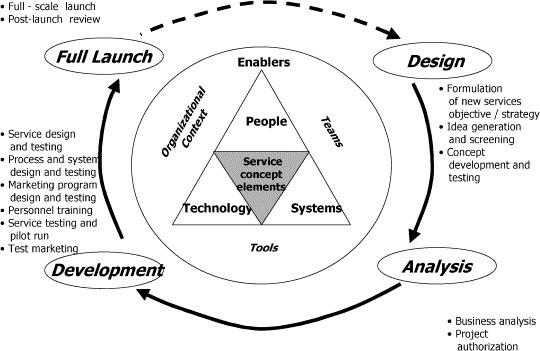 The heart of new service design process is the service concept which is the tool to visualize the properties of the service essence; what are the wanted outcomes? What are the desired experiences and in which way or form the service is provided? How the service is valued by the customers meaning how much customers are willing to pay for it? From these it is possible to create capability mapping which contains: Value, Form and function, experience and outcome. Creating capability mapping visualizes existing situation and the target situation or the differences between situations, times or service providers. New service concept and design is one thing, but what about existing services? How to ensure that that customer will be happy from the value of the service he received? What to do if the service we provided, didn’t meet the expectations? How to react on it? As we all know, services by their nature are intangible. This is causing a lot of troubles when people need to improve existing services. Plus, there needs to be in place a good measurement method, which is not simple task either. Sometime ago (1995), Arthur V. Hill in his article “Service Guarantees and Strategic Service Quality Performance Metrics at Radisson Hotels Worldwide”, introduced the concept of “performance service guarantee”. Imagine having a company, which would like to be position in the market within similar companies. In addition, this is company, where value proposition is not clearly defined. Workers are really demotivated, and they do have a lot of complains about customer’s expectations regarding delivered services. Nowadays this problem is present everywhere, and plenty of companies having issues finding the right way to solve it. Hart (1993) proposed solution called “unconditional satisfaction”. It was deployed by Radisson’s Hotel chain when its management created “100% Guest Satisfaction Program”. This two-steps solution based on idea, that company needs to respond all service failures with immediate compensation (Fitzsimmons & Fitzsimmons 2000, 269). They found out that customer’s complains are very valuable sets of information for the company and helping to turn dissatisfied clients into satisfied ones. People may think it does not have any sense, but the truth is, that this kind of approach has a significant impact on customer’s thinking about offered service, and the professionalism of the company. What’s really interesting, it helps in worker’s motivation as well. They are receiving clear message about vision and mission, and the importance of service quality in their company (Zeithaml, Parasuraman & Berry, 1990). Having in mind service recovery process as a positive factor and advantage for the company, it must be stressed here, that even the best companies are making mistakes, and aren’t free from errors. What’s the most important, well defined and conducted service recovery is giving the company a second chance to satisfy the customer (Fitzsimmons & Fitzsimmons 2000, 277). Well defined and conducted service recovery has the image of reliable service procedure, and only that can be translated by customer into positive feelings about the service experience (Zemke & Bell, 1990). Whole process will not have any sense without support from company’s infrastructure, culture, policies and procedures. Let’s take an example. Imagine the situation when people reserved the table in the restaurant, and when they are showing up at right time, but waiter is telling that there is no such a reservation and he cannot help them, as restaurant is fully booked. In addition, he is claiming that such a reservation never happened. How does it look in the eyes of customer? First of all, there is lack of communication between receptionist and waiter. Secondly, there is no recovery plan implemented in such situations; waiter just telling the customer to leave. How then you can confront this approach with coffee shop experience mentioned at the beginning? Clearly you can see here that, there is nothing such a “creation of memorable experience”. Customer will never reserve a table from there again. It will create a negative “halo effect” or “domino effect” (Halstead & Morash, 1996) as customer who “burned” once by a service (Fitzsimmons & Fitzsimmons 2000, 278) will always find faults in other service areas, and spreads negative “words of mouth” which could totally kill the business. Let’s stop here and answer to one fundamental question: “Aren’t we all responsible to create the memorable experience in every part of our lives?” We all are customers but as well suppliers. We are defining what we would like to receive, but there are others, who always expect something from us too. The knowledge how to deal with failures should be an essential part of everyday design process. People are doing mistakes, but the key point is continuous improvements, and how those improvements are implemented. We shouldn’t forget about that! Text by Laurea SID students: Daniel Augustyn and Tero Byman. This blog post was created as an assignment in SID course New service development and innovative service systems. experiences, Thousand Oaks : Sage.